1. Half of Greek children live in poverty. UNICEF takes the Eurostat definition of poverty, which is living on less than 60 percent of average income. 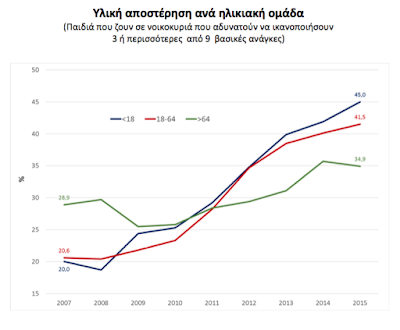 By that measurement, 27 percent of Greek children were poor in 2014. But UNICEF says that because average income has declined so much since the crisis began in 2008, this is a misleading measurement. So it has taken the additional step of looking at how many children live with less than 60 percent of average 2007 income – the last year before the crisis. By that measurement, 55 percent were poor in 2014, by far the highest proportion in Europe (see table below). In addition to measuring average income, Eurostat also surveys how many people meet nine criteria for material well-being. Failure to meet three or more of these classifies a person as materially deprived. 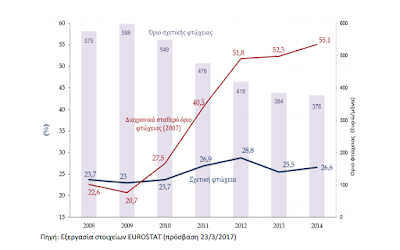 More than half of Greek households cannot pay utility bills without difficulty (59pc), go on holiday for a week each year (56pc) or meet an emergency expenditure (54pc). Another 30pc cannot provide adequate heat and 17pc cannot put meat or fish on the table every other day (see table below). Many of these figures are double what they were eight years ago. 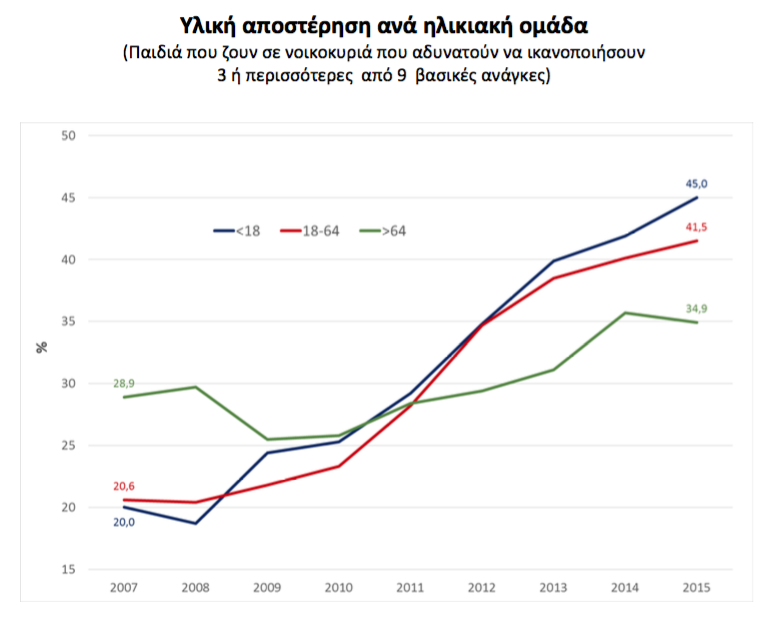 By this yardstick, 45 percent of Greek children lived in material deprivation in 2015. 3. The youngest are the most vulnerable to poverty. 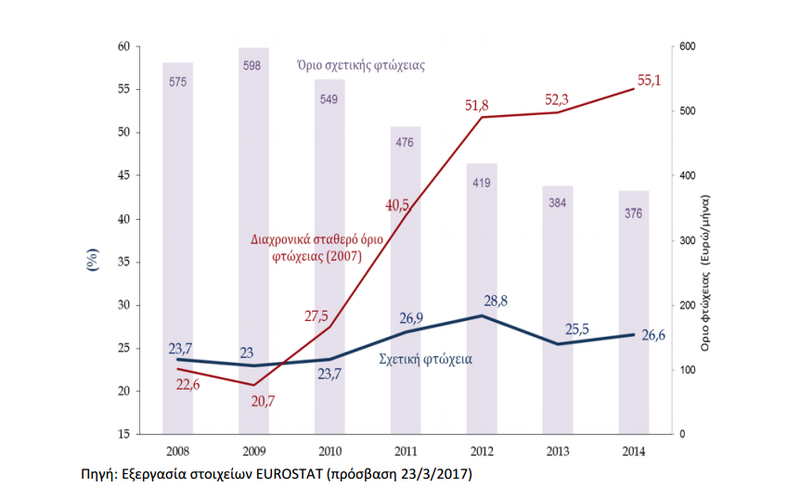 The most shocking fact is that the younger you are in Greece today, the more likely you are to find yourself materially deprived, rather than protected. UNICEF’s estimate, based on the same Eurostat figures, is that a little over a third of retired people are poor. The figure rises to 42 percent for the working-age population and soars to 45 percent for minors (see table below). Seniors are somewhat protected by their pensions, even though many of these are barely enough to live on (58 percent of pensioners earn less than €800 a month). But the figures clearly show that children are the most vulnerable group, and that Greece lacks the resources or policies to protect them.